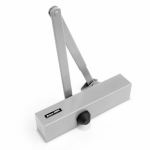 The Briton 2003e SES Size 3 Door Closer is a fixed power size 3 door closer made to cater to the majority standard door sizes (up to 950mm wide and 60Kg in weight). It comes complete with fixing packs to suit all standard fitting applications and is easy to install. Suitable for up to 2 hour fire doors. included in EN1634 fire test. Suitable for left and right handed doors. Suitable for doors up to 950mm wide, 60kg. Separate latch action and closing speed adjustment provides total accuracy of adjustment of the full closing cycle. Stylish flat form arm to match door closer cover. Classic fabricated cover conceals fixings and adjustment screws, reducing the risk of vandalism. Forged, heat treated and ground steel pinion for rugged durability. High quality hydraulic fluid with in-built temperature compensation ensures reliable operation in temperatures from -15C to +40C. Angle of opening/controlled closing 180. Quick and easy to fit, full fitting instructions and Xact fit template enclosed. Overhead door closers are fantastic for fire emergencies within commercial properties, but the Briton 2003E offers more than just security, it offers smooth clean finish appealing for your door.